While I pick, and advertise, the themes for the weekly preschool storytime a month in advance, the elements I include may be a little more in flux. For example, sometimes the activity/craft portion of storytime is planned well in advance and sometimes I modify it at the last minute. 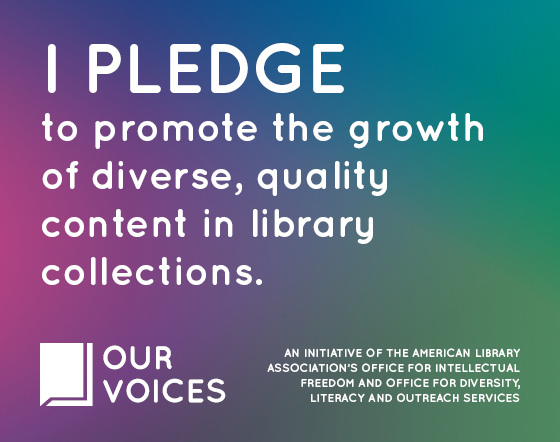 This week’s storytime is an example of theme-related activities that shifted after I came across a great idea- this one from Jennifer Whorton on the ALSC listserv and via her In Short, I’m Busy blog. The idea was to offer kids an opportunity to paint and to shake up the storytime routine by dividing the art activity into two parts, instead of doing all of the art after the stories. I love giving kids the chance to paint, but carrying wet paint projects out of the library gets tricky for caregivers. I decided to incorporate the painting and collage that Jennifer used to make bears similar to Eric Carle’s animals in the last story we read. As families arrived I welcomed them to storytime and told them about our change of schedule. The painting activity at the beginning of storytime offered families a great transition from outside into the library. I had the painting station set up for the first fifteen minutes and had kids paint an entire sheet of white copy paper with brown tempura paint (see materials and more at the bottom of the post). We set them to dry and moved over to the storytime area where kids sat down on their mats and caregivers got comfortable nearby. Note: families arriving after 10:15 were offered a modified, dry version similar to the painted collage, minus the paint. We had lots of new families join us this week, so I re-introduced the Rhyme Cube. A few kids had a chance to roll the cube and choose the welcome songs we sang. We sang “If You’re Happy and You Know it” (growling like a bear) and “Itsy Bitsy Spider” (plus Biggy Wiggy Spider). I then introduced this week’s theme, bears. Bears have been on my mind since seeing some footprints of a visiting bear on my dirt road recently. I showed off this photo of one of the bear prints and my hand using my phone while we named the three kinds of bears in Alaska (polar, brown, and black), talked about what bears look like, and shared what else we know about them. It has been a warm Fall with no notable snowfall up to this point, so our conversation led to how the weather might affect their traditional winter sleep patterns. I brought along my brown bear finger puppet for the first song, which kids easily sang the second time around because of the familiar tune. Our first story was Polar Opposites by Erik Brooks (Marshall Cavendish Children, 2010). After a refresher on opposites, with the kids sharing lots of examples, we read the tale of the big polar bear Alex from the Arctic, and Zina the tiny penguin from Antarctica. With lots of visuals to reinforce the differences between the two lives of these cheerful animals, the story follows Alex and Zina as they plan a trip to meet up in the Galapagos Islands, near the Equator and in the middle. This is a great story to use along with a globe for an introduction to map and globe concepts. The next action rhyme we did was one I found on Storytime Katie’s site, which she used as a flannelboard activity. I decided to bring out the plethora of stuffed bears I have at home instead. Between my two kids, I was able to come up with four little and five big to go along with my brown bear finger puppet. Boy, does a hoard of stuffed bears really get a group of preschoolers’ attention! At first I was a little confused about this rhyme. The unpatterned addition and subtraction of bears left me a little bewildered; like I’d missed something. Then I realized that was the beauty of it. As a group we decided how many to take away with each verse and how many to add back to the bed. THE KIDS LOVED IT. Preschool math in storytime? Easy! After this activity, the kids were pretty wound up. Kids were wandering all over and more had arrived since the beginning of the hour making for a bit of chaos. As I began to clean up the bears, I began singing this simple attention-getting song to get us ready for the next book. If you’re ready for a story, find your spot. Magically, everyone was in their spot when I was done putting the bears away and the song was finished! More math in storytime! 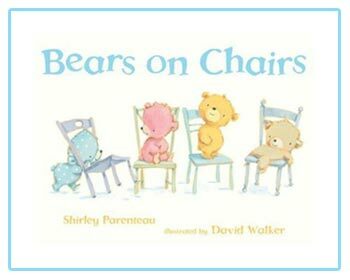 Bears on Chairs by Shirley Parenteau and David Walker (Candlewick Press, 2009) is a lovely rhyming book for preschoolers that features four lovely bears, each with their own chair, happily sitting together…until poor brown bear comes along with nowhere to sit. Five bears with only four chairs. What are the bears to do? Watching preschoolers work out solutions for the bears was wonderful! We decided the bears needed one more chair. Before finding out the bears’ solution, we came up with a variety of suggestions that included buying a chair, making one, borrowing one, and even stealing one. After briefly talking about the moral ramifications of that last one, the group suggested sharing! They even tried to figure out how the chairs should be shared, just like the bears. It was time for our last book and the final step of our art project. 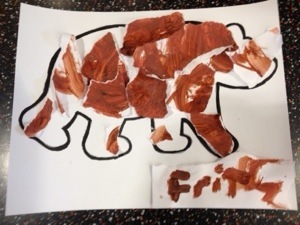 To show kids and caregivers what inspired our project, we read a large format version of Eric Carle and Bill Martin,jr.’s Baby Bear, Baby Bear, What do You See? The story, with its rhyming and repeating text, follows a baby brown bear as it searches for its mother. Along the way the baby bear meets a variety of North American animals. This book provided a nice opportunity to talk about why it’s valuable to read books everyday with children- books introduce fun, new vocabulary, like flying squirrel and mule deer, that may not be present in everyday conversation and having a diverse vocabulary is an important early literacy skill. Now that stories were read, songs were sung, and paint was dry, it was time to cut or tear up the painted brown paper and create a bear collage! Before we moved to the art area, I explained the day’s activities again. Families who arrived late were a bit disappointed, but I offered them an alternative to the painted collage. I’m hoping it will encourage them to join us for the whole storytime in the future! This bear was created by a 2-year old and his dad. I love the artwork! It’s beautiful and a great project. I also wanted to let you know that the author of Ten Teddies contacted me via me blog comment (http://storytimekatie.com/2011/06/10/flannel-friday-ten-teddy-bears/#comment-311) and asked for a copyright line. It’s up to you, of course, but I just wanted to pass along the info.